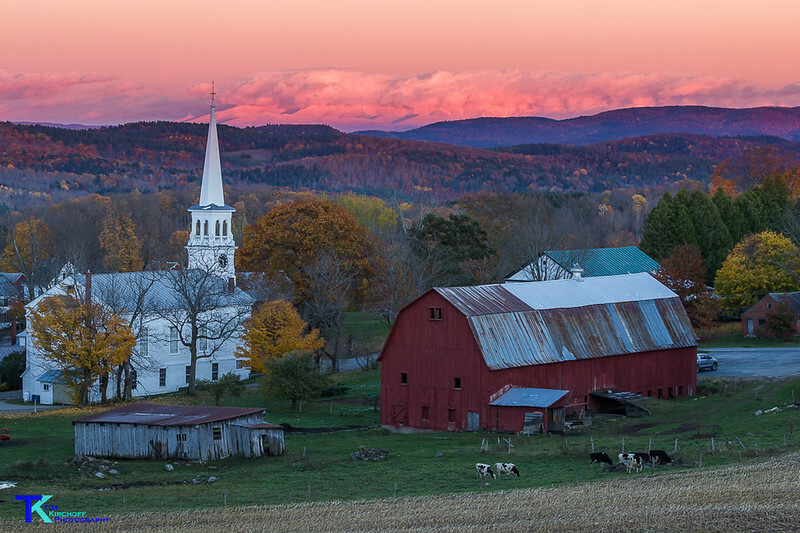 Scenes of Vermont Forums • Full Harvest Moon 2017- Will you be in VT to watch it rise over the mountains? Full Harvest Moon 2017- Will you be in VT to watch it rise over the mountains? Those who know me, know I LOVE full moons. Especially the full harvest moon! Let's hope the weather is clear on the night of the full harvest moon this year. Technically, the Harvest Moon is the Full Moon closest to the September equinox around September 22. Most years it is in September, but around every three years, it is in October. The Harvest Moon is the only Full Moon name which is determined by the equinox rather than a month. Traditionally, people in the Northern Hemisphere spent the month of October preparing for the coming winter by hunting, slaughtering and preserving meats for use as food. This led to October’s Full Moon being called the Hunter’s Moon, Dying Grass Moon, and Blood Moon or Sanguine Moon. However, this should not be confused with a Total Lunar Eclipse – Blood Moon. I love it when the harvest moon occurs when I am in Vermont. It is a special treat to be at my inn and see the harvest moon rise over the mountains, stirs the soul! I'll be in Waitsfield this year for this event and am hoping for a clear, autumn evening! Neil Young's Harvest Moon is the best song to play as the moon rises in Vermont. Re: Full Harvest Moon 2017- Will you be in VT to watch it rise over the mountains? Folks! Don't forget the Full Harvest Moonrise in Vermont on October 5th!!! I'm going to sit on my porch at the inn and watch it rise over Common Road in Waitsfield. It's a totally special experience to see it when you are on vacation in Vermont. The weather is going to be amazing, enjoy! Peacham is a great place to photograph the moonrise as well. The view to the east is excellent there. Tim that is one spectacular photo. We will be in Vermont for the full Harvest moon. I can't wait. How far is Waitsfield from White River Junction? courtmel wrote: Tim that is one spectacular photo. We will be in Vermont for the full Harvest moon. I can't wait. How far is Waitsfield from White River Junction? If you take I-89 to Middlesex and down Rt 100 it is around 1 hr 15 min. If you take Exit 3 off of I-89 oyu have the option of going over Roxbury Gap or going over Bethel Mtn Rd to Route 100. Both of which are scenic and will take closer to 1.5 hrs. The full moon is on October 5th. Note that on 10/5 the moon rises at 6:44 pm and sunset is 6:23 pm. But on October 4th the nearly full moon rises at 6:13 pm and sunset is 6:24 pm. That night would also be good for viewing and photographing the moon with a little more light available. Thanks for the information Ed. Two great nights to relax by the harvest moon! It is so enchanting! Last year I drove up to Common Road to watch the moonrise but it was sooooo dark up there and I started hearing noises in the woods so I scooted back to my inn! I'll watch it from the porch this time. Someone later told me there were porcupines on the same area I was standing!!! Tim Thanks for the info. I hope Peacham isn't as far from our base in White River Junction. I would love to be around Peacham for the full Harvest Moon on Thursday evening. Your picture is so awesome. Great work! I love this forum. Oh my goodness! The full harvest moon rising over Common Road was AMAZING tonight! A gorgeous evening in Vermont paired with the full harvest moon. Now how's that for perfection? Sitting on the rocking chairs with a slight breeze curling around the inn and crickets in the background. I'll save this one in my memory bank! Got some folks at the inn together on the front porch and it was wonderful! Met some incredible travelers here this time around. Hope you all enjoyed it as well! Another full moon winner out there tonight! Clear skies and blissful! Hope you all enjoyed watching it rise high in the sky! Most of all, we are here in Vermont to witness such a lovely event!